New Treatment for ACL Repair? The anterior cruciate ligament (ACL) is an important stabilizingligament in the knee joint that is commonly injured in athletes. Repair of the ACL has been attempted in the past with mixed results, primarily because this ligament does not always reliably heal. Since then, the orthopaedic community transitioned to reconstructing the ligament with a tendon graft to allow athletes to get back on the field. But what if the ACL could be reliably repaired with the help of some modern technology? That is the question being asked by many researchers. Among them, Martha Murray, MD, from Boston Childrens’ Hospital, who recently spearheaded a technique and product that allows for successful repair of a recently torn ACL. This technique is called the Bridge-Enhanced ACL repair (BEAR), which utilizes sutures and a special platform to promote ACL healing. 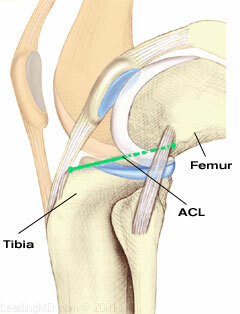 The scaffold/platform is a special protein-enriched sponge that is placed in between the torn ends of the ACL. This sponge is injected with the patient’s own blood, allowing a clot to form to begin the healing process. Using the stitches, the torn ends of the ACL can be drawn into the sponge and can reconnect to establish new, healed tissue. This tissue replaces the sponge over a period of 6–8 weeks. The early results of this technique are promising, however this work is still in the experimental phase undergoing FDA testing. The current trials are being performed at select centers by a small group of surgeons and patients can only get this treatment if they consent to being part of a clinical trial. While this work is exciting and may someday change the way we fix the ACL-torn knee, the current standard of treatment is ACL reconstruction. This is one of the most common orthopaedic surgical procedures and its results are reliable. Only time and continued research efforts will tell if ACL repair offers similar reliability for athletes.